During the summertime, I look forward to purchasing a lot of great tasting figs from our local fruit orchard and one of the recipes I enjoy making with them is Fig Preserves. 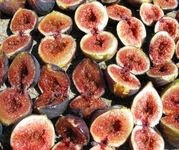 If you are not familiar with how to purchase and store figs, let me give you a few tips. Figs are a very fragile fruit so they need to be handled carefully. You never want to toss them around in your shopping bag or basket. When selecting the perfect fruit, you always want to check for blemishes and only purchase ripe ones that are defect free. Figs do not have a long shelf life so they need to be eaten up within 2 days of purchasing them. When storing them, store at room temperature and allow the air to circulate around them. You do not want to store your figs near a heat source or window. Serving Ideas: Fig Preserves are great served on fresh bread, on bagels, as a pancake topping, on muffins and rolls, with crackers or as a marinade for poultry. You will want to start out by washing and drying your figs. Cut them down and mash them with a potato masher. In a large stock pot, combine the mashed figs, granulated sugar, lemon juice and the lemon slices. Pour in just enough tap water to help dissolve the granulated sugar. Turn the heat up on your burner to medium-high and bring the mixture to a rapid boil and boil for 12-15 minutes. You will need to stir the mixture pretty often to keep it from scorching. (tip: I like using a silicone spatula for stirring so that the mixture doesn't stick to my spoon). Once it is done cooking, ladle the preserves into hot, clean, pint sized glass canning jars. You will want to process them in your water bath canner for about 10 minutes or follow the directions that came with your canner for processing preserves. Once they are done processing, remove them from the water bath canner (allow the water to drain off the jar and back into the canner) and place them onto a wire rack to cool. Once cool, label your jars. Your new fig preserves will keep for up to 1 year if they have been canned properly. Shelly Hill is a mother and grandmother living in Pennsylvania who enjoys cooking, baking and canning. You can visit Shelly's online foodie blog called Shakin 'N Bakin in the Kitchen. I currently have a cookbook giveaway being hosted at my blog.